Tonight was bread club. This week, we made a dough using our sourdough starter which I will bake tomorrow night. We also made little Chelsea buns - sweet or savoury. 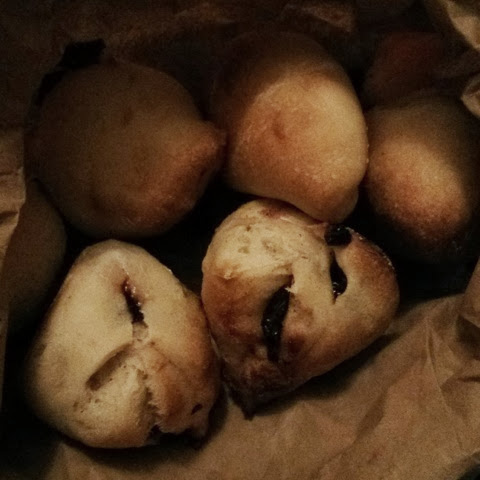 I made some with a cranberry, raisin and mixed spies filling; and some with an onion, black olive and rosemary filling. They were yummy! I could have put a bit more filling in though - I was worried I wouldn't be able to roll it up so didn't put loads in. They should maybe have been a little bigger but as its only a short class we didn't have time to leave them to prove for as long as they should do. The Chelsea bun recipe can be adapted to any type of filling - I can't wait to experiment with some other flavours!